During October and November, five North Shore public libraries will present the seventh annual From Page to Stage, a series of programs related to the Writers’ Theatre production of Harold Pinter’s award-winning play The Caretaker. We will be hosting the From Page to Stage Kick-Off program and reception on Monday, October 3, at 7:00 p.m. on the second floor of the Woman’s Library Club (325 Tudor Court). Always a highlight among the From Page to Stage programs, this year’s kick-off will feature production members and artistic director Michael Halberstam, who will discuss the play, Pinter’s work, and the upcoming production. Stay after the discussion to enjoy coffee and desserts as we celebrate this annual literary event! Thanks to the Woman’s Library Club for their support of this program. For more information on this program please visit the Writer's Theatre website. Every year, the American Library Association co-sponsors Banned Books Week, to help remind us not to take our freedom to read for granted. This year, Banned Books Week runs from September 24th - October 1st. Visit the library for banned book displays and handouts or go to the American Library Association's Banned Book Week site for more information. Also, make sure you join us on Sunday October 2nd at 2:00 when City Lit Theater's Books on the Chopping Block performance returns. This will be a live concert reading of excerpts from the top ten most frequently challenged books of 2010. The performance runs 50 minutes and will be followed by a brief discussion. While the program is intended for adults, children in grade 6 and up are welcome to attend. Many of you are familiar with My Media Mall, our site for checking out ebooks. Finally, you can check out books from My Media Mall to your Kindle! Start by visiting My Media Mall and click on the picture that says Now Available: Library eBooks for Kindle (or you can scroll down and choose the Kindle option under Collections). You can add books to your cart or place a hold if there is not currently a copy available. When you check out, you will be sent to the Amazon site where you will be given the option to send the book to your Kindle. Ebooks from My Media Mall can also be checked out to Kindle apps (on devices like iPad, iPhones and computers) and the Kindle cloud reader. You will need to be on a wireless network to check out books wirelessly - 3G only Kindles will need to have the usb cord attached to transfer a book. You can now use your credit card to pay library fines online. When logged in to Bibliocommons (our online catalog), you will see an option for Fines on your My Bibliocommons page. Click on Fines and you will be presented with an option to Pay Fine Online. You can then use a credit card to pay for your fines, with no additional fees. We hope you find this new option to be useful! It took the summer off but now it's back and ready to talk about the books that men like to read...that's right, our Guys' Book Group has returned! 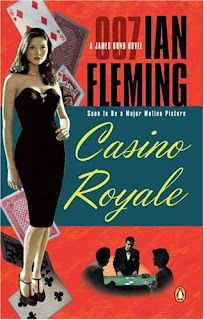 Join us on Tuesday, Sept. 20th at 7:30 p.m. to discuss Casino Royale by Ian Fleming. This discussion of a thrilling James Bond novel is also open to gals. On Friday, September 16th we will be closed for Staff Development Day. We will reopen for normal hours on Saturday the 17th. Also, please remember that we are now open on Sundays. We are happy to announce that the library now offers access to Ancestry (Library Edition) and Proquest Obituaries. Both are available from the library or from home (with your library card). Ancestry offers census data, immigration records, directories and more, while Proquest Obituaries lets you access more than 10 million death notices from top newspapers. Together with the historical Chicago Tribune and historical New York Times, you now have a great resource for your genealogy search! Thanks to the Friends of the Library for making this possible! Beginning Sunday, September 11th, Sunday hours will resume and will continue through the winter and spring. We are open from 1 to 5 on Sundays. We look forward to seeing you here!